Whistles blow as volunteers wearing blue visors and carrying placards instruct commuters in Shanghai’s hectic People’s Square station to let passengers out of trains first before jostling their way in. Shanghai, considered the world’s most populated city proper (Source: Wikipedia), will further stretch its population capacity when the city is bombarded with visitors of the 2010 World Expo this May. 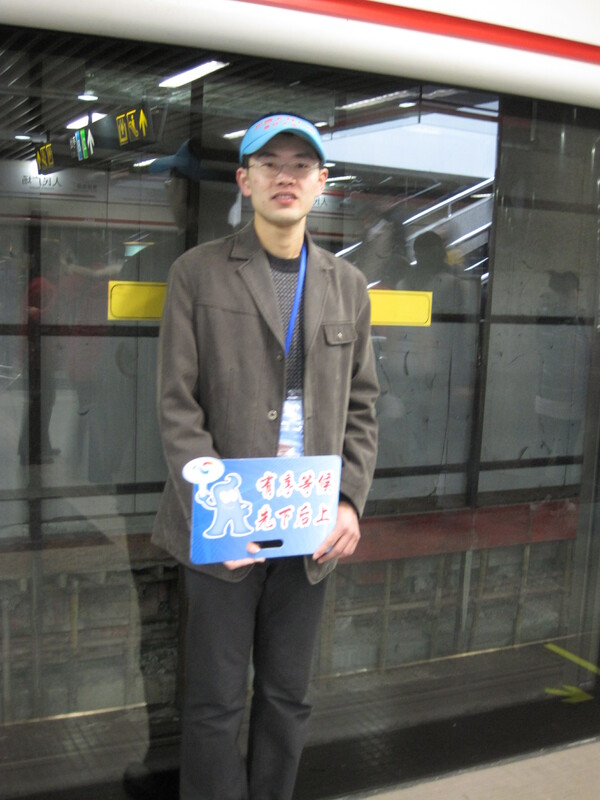 The blue placards feature a picture of Haibao, the Expo mascot, saying: “Wait orderly. Come off, and then go on,” (有序等候，先下后上) an attempt to encourage citizens to be less brusque in their daily commute by waiting patiently and making lines. Though the overall intention of the campaign to create a more “harmonious” and “civilized” (和谐,文明) city may be well, commuters in Shanghai see their current condition as a result of overpopulation and the lack of public awareness. 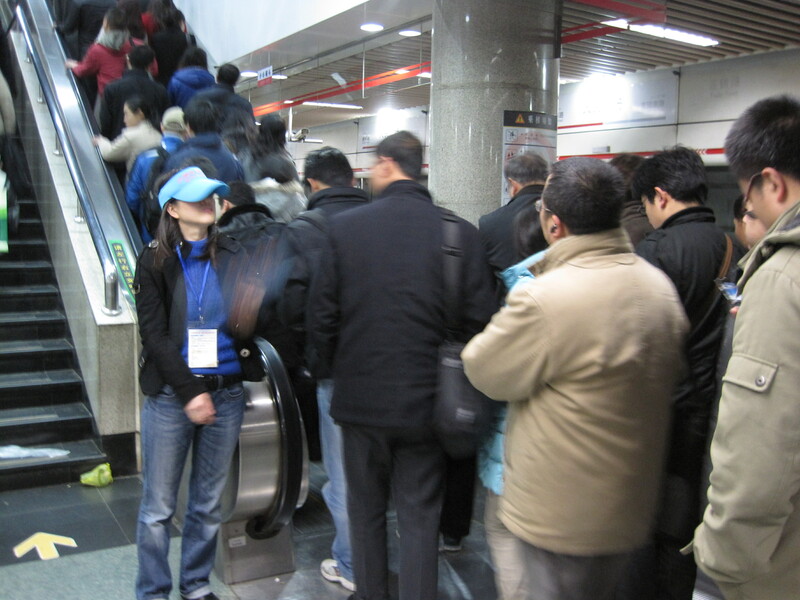 Lining up in the subway is viewed as futile because many hasty commuters often cut the lines with little regard to courtesy – let alone posted rules. And those who do wait are often left behind. Habit or not, if you have ever had to change trains at People’s Square station during rush hour, the shear volume of bodies in transit is enough to send even the most daring into claustrophobic sweats. Every morning, three packed escalators in the center of the station stream columns of people in both directions rushing towards the already packed trains. Before the public campaign commenced, people would congregate around the door, and at the first sign of it opening, push through passengers attempting to alight. Now, with whistles blaring, commuters are methodically being tuned to embrace the idea of waiting and lining up. Once inside the train, however, there is barely any room to move and – further more – a rarity to even get close to a seat. During peak traffic, the amounts of people pressed against me make it impossible to even lift my arm to check the time. 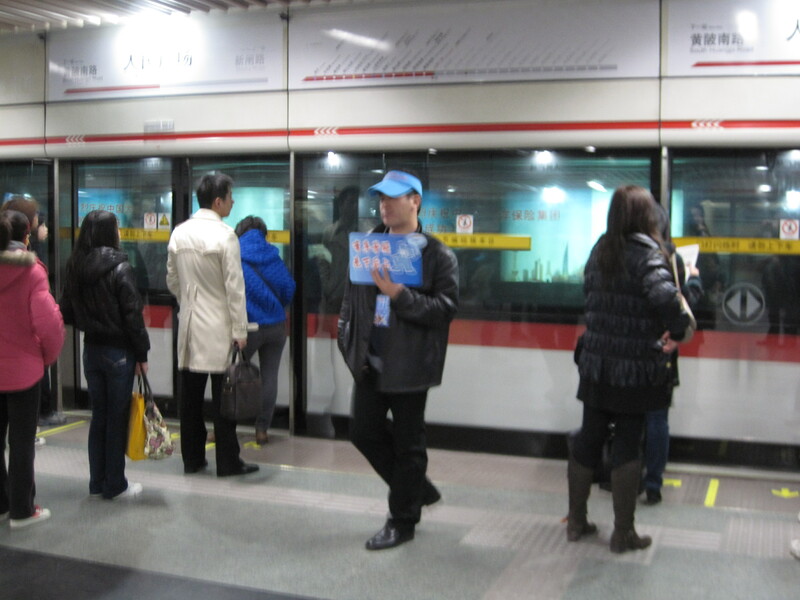 In the advent of the Shanghai Expo, the Shanghai Metro plans to open five new subway lines. It is a monolithic undertaking done with the hope that the edition of new lines will diminish traffic congestion and compel people to act more courteously when the spotlight comes to Shanghai this May. Many stations are already fitted with glass barriers to prevent people from being pushed off of crowded platforms, and more are planned to be installed. The lines may be built, and the instructions lain out, but will it be enough to make commuters more courteous?